The Serta Perfect Sleeper you’ve always known and trusted or the new and improved Memory Foam in Colorful Dora & Diego “Time to Explore” moisture resistant covers. The Serta Perfect Sleeper Dora & Diego mattress is quilted in a cloud like pattern to allow the mattress to fill in all the curves on childs small body. The Serta Dora & Diego Memory Foam mattress has a smooth zippered cover with the great feel of memory foam. Children love the way memory foam feels. Memory Foam conforms and takes the shape of each individual body no matter what size or shape. Available in twin or full size mattresses or mattress sets, Dora & Diego Mattresses by Serta offer exceptional value and make bedtime fun. The Perfect Sleeper model is considered a Luxury Firm and is a great choice for Daybeds, Bunkbeds, and other children’s furniture. The Memory foam version is approximately 7″ thick so it can also be used for Bunkbeds, Daybeds, and Trundles. 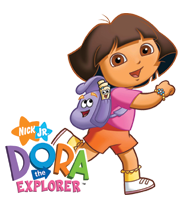 Your little one will love Dora & Diego by Serta Mattresses.